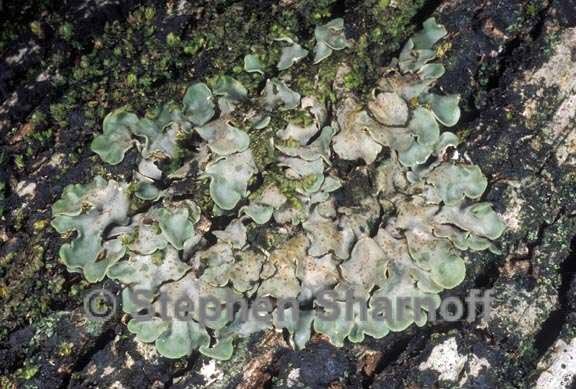 Thallus: squamulose squamules: 4-10 mm in diam., comparatively thin, 0.2-0.35 mm (where not swollen by perithecia) thick, lobed, flat or undulate, the edges usually slightly inrolled, loosely appressed, ± overlapping to distinctly imbricate upper surface: pallid alutaceous or tan to grayish brown or darker brown, smooth, dull or subnitid, epruinose or slightly grayish pruinose upper cortex: 25-40 µm thick medulla: white, entirely prosoplectenchymatous, composed of hyphae closely interwoven in various directions; algal layer: about 100 µm thick lower cortex: composed of roundish-angular cells [10-20 (-25) µm in diam. ], outwardly becoming gradually dark brown lower surface: pale along margins (rarely dark throughout), minutely scabrid under 10x lens, centrally blackening and ± fasciculate-matted, i.e. with conspicuous, crowded, black (outer ones may be pale) fascicles of rhizohyphae; rhizohyphae: stilt-like, centrally supporting the squamules (marginal zone: bare), hyaline or brownish, 5-6 µm thick, mostly matted together to form brush-like bundles (50-200 µm in diam.) Perithecia: broadly pyriform, up to 0.35 mm wide; exciple: pale except for the ostiolum asci: cylindrical, 50-60 x 8-11 µm, 8-spored ascospores: uniseriate, ellipsoid, 9-12 x 4.5-5.5 µm Pycnidia: marginal, appearing as small dark knobs conidia: bacilliform, c. 4 x 1 µm Spot tests: all negative Secondary metabolites: none detected. Substrate and ecology: on bark (mainly oak) in open woodland, rarely on mosses or humus over rock World distribution: North and Central America, especially in the southeast, becoming rarer westward Sonoran distribution: rather rare in SE Arizona, central California, Baja California Sur and Chihuahua. Notes: It is an easily recognizable species due to its comparatively thin and large squamules that are elevated from the substrate by bundles of rhizohyphae (not true rhizines). The prosoplectenchymatous medulla and small spores are also diagnostic. The species occurs preferably on bark. 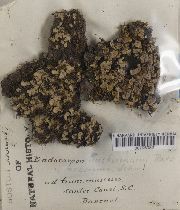 Specimens on mossy rocks or humus have been misidentified as other species.